Blog Proteccion Software - What is Software Protection? A based security device, with USB for PC host connection, providing secured information storage, challenge-response authentication and cryptographic calculation functions, for software licensing, data encryption, software copy protection and software piracy protection. 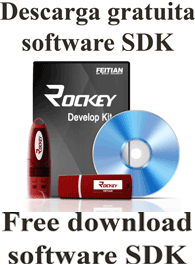 ROCKEY family products are designed to help soft ware developers to protect their software intellectural property rights through ROCKEY's advanced hardware based protection system thus prevent revenue loss due to software piracy. ROCKEY offers full-range-solution from most cost-effective secure chip device to latest 32bits high performance smart card chip device. The industrial innovative .NET protection dongle, USB Flash disk embedded dongle are also available. Any software has the requirements for protection against illegal copy and piracy. Any application needs license management and control system with advanced remote update capability. Any system demands the flexible authentication mode including date based, elapse period based, used times based, network based authentication. Any data requires being encrypted with advanced cryptographic algorithms, seamlessly integrated into the operating system and transparent to both developers and users.